The actress, who received the Smita Patil Memorial Award, said she will always consider Patil as her younger sister. Mumbai: Veteran actor Rekha said Smita Patil was a far better actor than her, and she has no qualms accepting that. Rekha, who received the Smita Patil Memorial Award here on Saturday night, said she will always consider Patil as her younger sister. "I am here to receive this award which signifies the excellence of her craft, her acting, dancing abilities or her ability to be fearless in front of the camera or the way she could lift those beautiful eyes of hers and make a statement without saying a word. All of this is not why I have received this award," Rekha said. "She was way more brilliant as an actress, which I got to know 30 years ago when I saw her films. She is a far better actor than me or anybody else. She was, is and will always remain my choti si pyaari behen (younger sister)," she added. 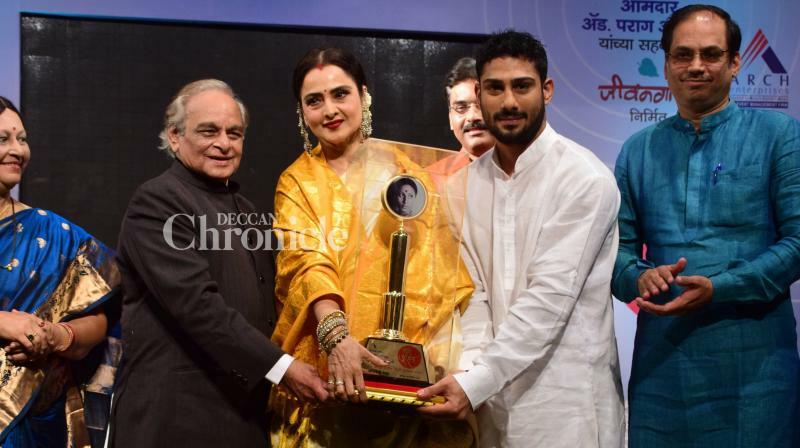 Patil's son, actor Prateik Babbar and noted music composer Anandji Virji Shah were also present at the ceremony. "In moments of doubts, you can call me. I shall try to be someone, who is a part of her. I always felt a connection with her. Pratiek is a living example that she is right here with us," she added.